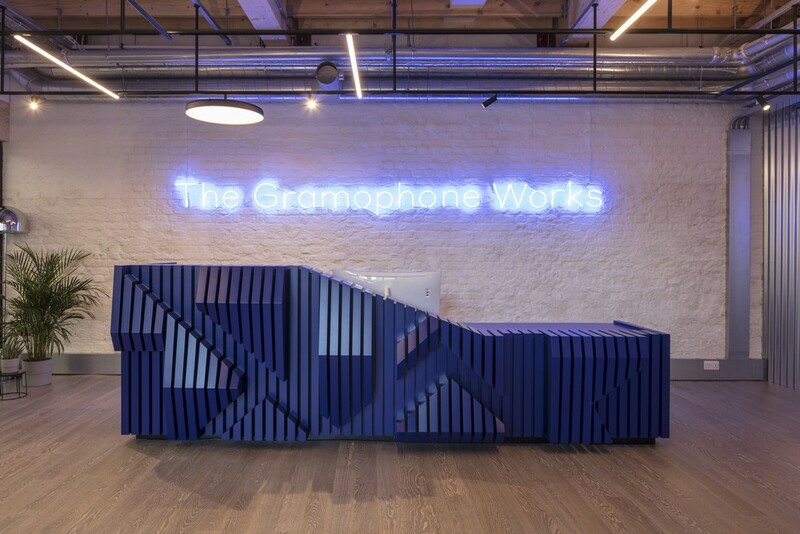 A former vinyl factory alongside the Grand Union Canal in west London has been reinvented as The Gramophone Works, a new creative office hub designed by architects Studio RHE. Formerly known as the Saga Centre, The Gramophone Works dates back to the 1920s and started producing vinyl in the 1960s, acquiring reggae label Trojan Records in 1975. 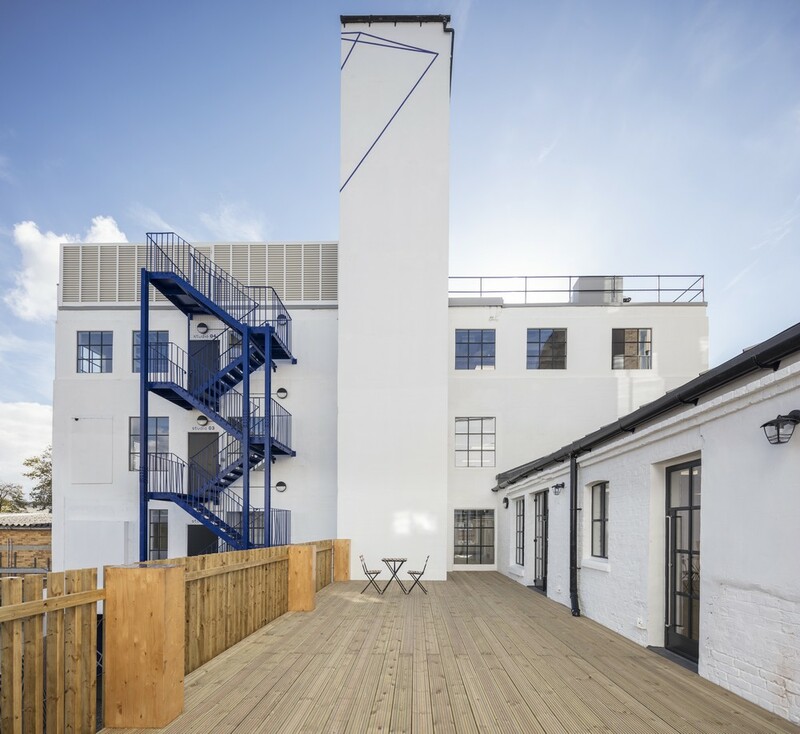 As part of Resolution Property’s wider regeneration, the first phase of works includes the refurbishment of the existing twentieth century building. Studio RHE has restored a dilapidated five-storey Art Deco building dating back nearly a century, liberating the previously congested plans, improving circulation and opening the building up to more light to create 20,000 sqft of office space. 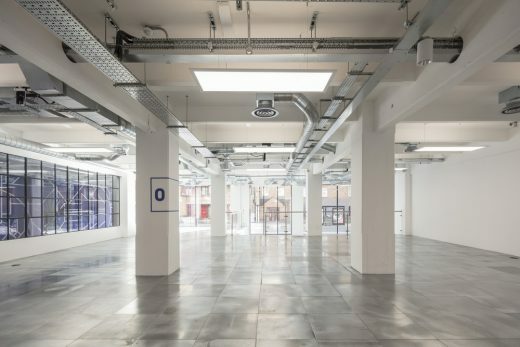 Aimed at small to medium enterprises in the creative sector, the flexible and efficient open-plan Category A spaces are designed to encourage a social working environment for the fruitful exchange of knowledge and ideas, with floor plates ranging from 600 – 5,000 sqft. 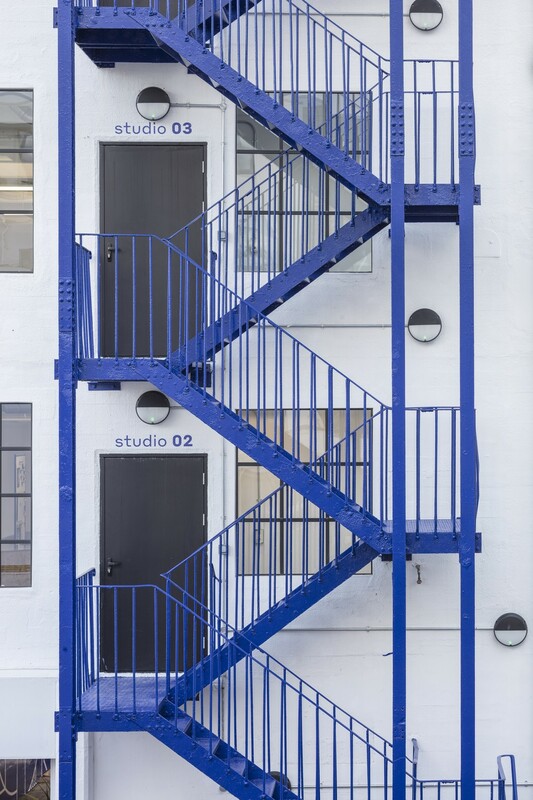 Studio RHE’s design references the site’s long industrial history including its origins as a canal goods loading dock and storage shed. Existing facades have been repaired, repainted and internally insulated to improve thermal efficiency. New windows are double glazed heritage style in sympathy with the buildings, with the exception of aluminium-framed contemporary glazing in the new reception. 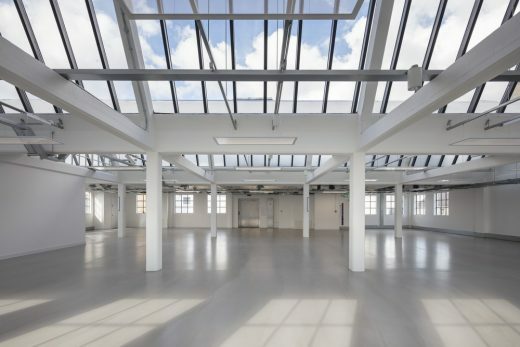 A glazed atrium also sheds light onto the top floor office space and copious rooflights create bright, naturally lit spaces. 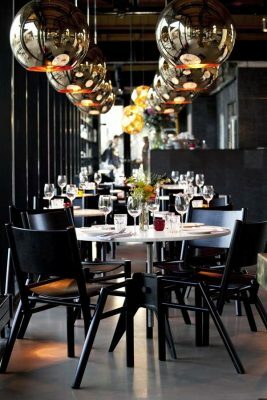 Internal finishes are robust with expressed ceiling structures, exposed brickwork feature walls and galvanized steel finished exposed services. The ground floor reception area includes a timber reception desk with neon signage as a backdrop. Feature LED linear lighting also runs through the communal hallways alongside a patterned feature wall with a simple colour palette of electric blue and white, and parquet style flooring. 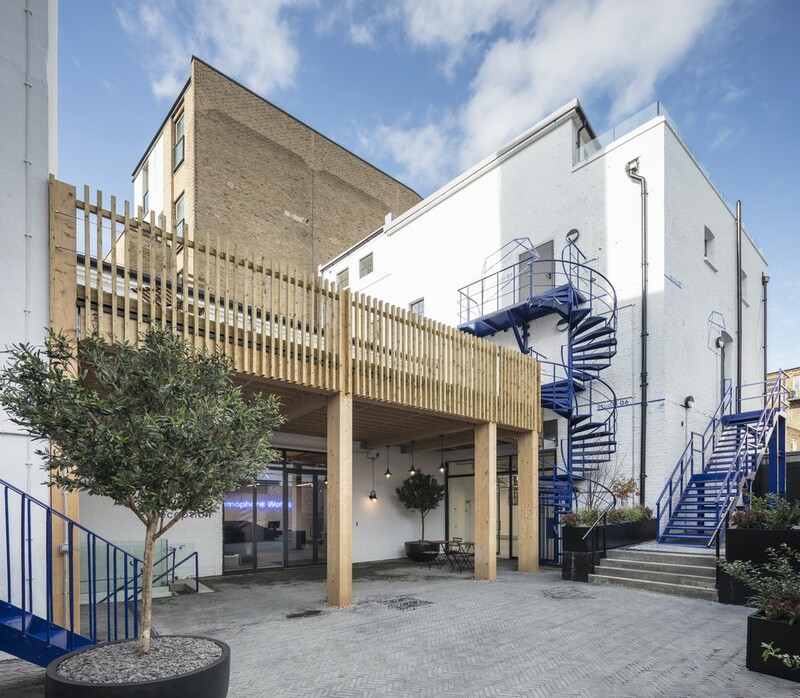 Shared facilities include a communal reception with an event space as well as cycle storage, changing rooms with shower facilities, an external courtyard, café and three outdoor terraces. 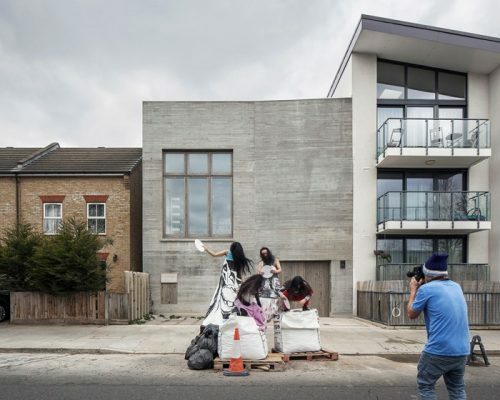 “Our contemporary response reinvents this historic collection of buildings by creating a vibrant community that will future proof the site for many years to come,” says Richard Hywel Evans, founding director of Studio RHE. James Baker, Head of UK Asset Management at Resolution Property, said: “West London has long been established as a hub for emerging media and creative businesses. 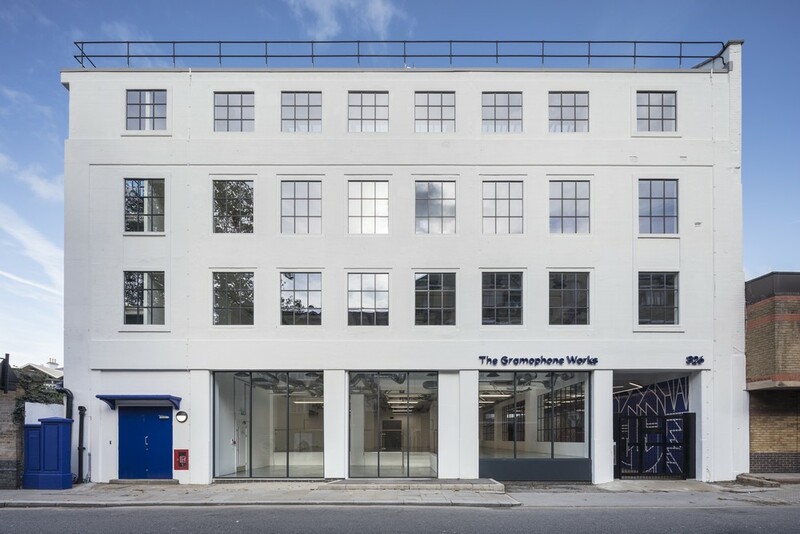 The Gramophone Works offers exceptional new space to these businesses and others looking for high-quality workspace on the City fringe. When the redevelopment completes in 2020, The Gramophone Works is expected to generate 1,000 jobs as a new creative hub for west London. 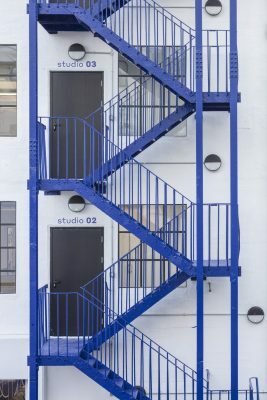 Studio RHE is a London-based practice with a global reputation for delivering bold and innovative architecture. 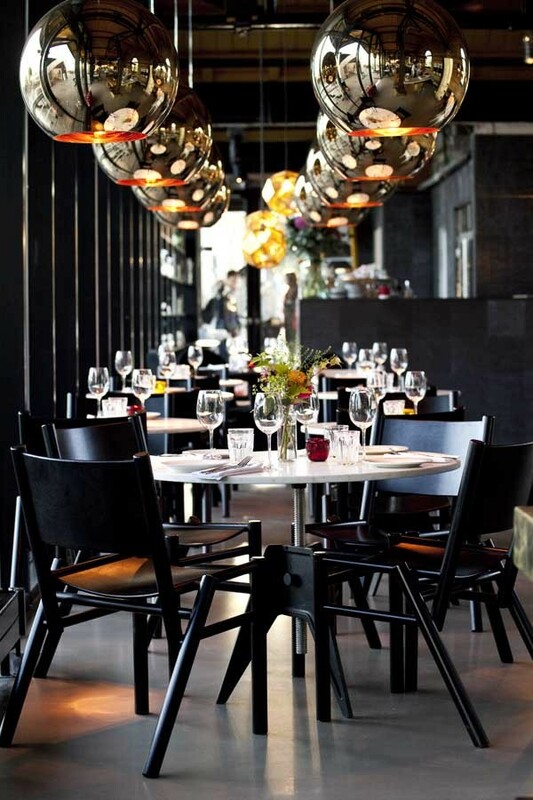 The practice has over 20 years experience working internationally.